Strand Woven Bamboo & Eucalyptus Flooring Have Surpassed 5,000 on the Janka Hardness Scale. Due to their hardness, our floors can go where traditional hardwoods can't. Our super tough Accuseal Ultra®Finish System provides 24 hour protection against spills and puddles. Our renewable bamboo & eucalyptus regrow in 3-7 years. Used by the world's leading architects and designers in homes & businesses. Versatility to be installed on multiple subfloors. Check out our wide array of plank profiles to suit your installation needs. As much as 3X harder than oak hardwoods, these tough floors provide a warm wood look and feel. Perfect for DIY'ers, they require no glue or nails. These snap together floors make installation and repair a breeze. Our traditional eco-friendly bamboo flooring showcasing the distinct nodes of the bamboo plant. For the discerning shopper, these beautiful and eco-friendly surfaces lend a rustic touch to any space. With high dimensional stability, this is an excellent choice for below-grade or basement installations. Bamboo is the fastest growing plant on earth, with a tensile strength comparable to steel. Despite being categorized as hardwood flooring, bamboo is actually a grass, not a wood, and it grows in specific climates all over the world. Made into bamboo flooring, it is beautiful, durable and sustainable. Eucalyptus also re-grows very quickly - in as little as 3 years, and our eucalyptus strand woven floors are just as hard as our strand bamboo. For these reasons, bamboo and eucalyptus are rapidly becoming come of the most popular types of residential and commercial hardwood floors installed today. When discussing the pros and cons of different flooring types, it is not hard to see why these tough, eco-friendly floors are being chosen by the world's leading designers and architects for their most important projects. To make our bamboo flooring, we harvest A grade Moso bamboo when it is between five and seven years old (6" to 8" in diameter) to ensure maximum strength, durability, and quality. After stripping off the outer layer of green skin, we slice only the middle of the culm - the most resilient part of the stalk - into long strips. Depending on the type of flooring, the strips are then heated, dried, and fused together under immense pressure to make flooring boards. Want to know more? Check out our in-depth look at how bamboo floors are made. Our eucalyptus strand flooring is made much in the same way, using hand-picked raw materials that regenerate in as little as 3 years. Our strand woven compression process, precision milling techniques and proprietary AccuSeal™ finish system result in a wide variety of stylish, stable bamboo and eucalyptus flooring options that will last and add value to your home. Ambient® as attained a reputation as one, if not the, best bamboo flooring products available on the market today. This is because we were one of the first companies in the world to design and sell strand woven flooring. Why Bamboo & Eucalyptus Flooring? Ambient® is proud to harvest all of the raw materials used in its flooring from well-managed forests. We are also proud to carry Floorscore Certified products that are tested annually to ensure they are within standards such as CARB Phase II, which is the strictest indoor air standard in the world. Another advantage of our bamboo flooring is that it also contributes to LEED credits and meets the strictest environmental standards. The Forest Stewardship Council is an independent, not-for-profit organization established to promote the responsible management of the world's forests. Fast regrowth. Almost 1 million acres of forest vanish per week. While a 60-foot hardwood cut for market takes 60 years to replace, a 60-foot bamboo cut for market takes only 59 days to replace. 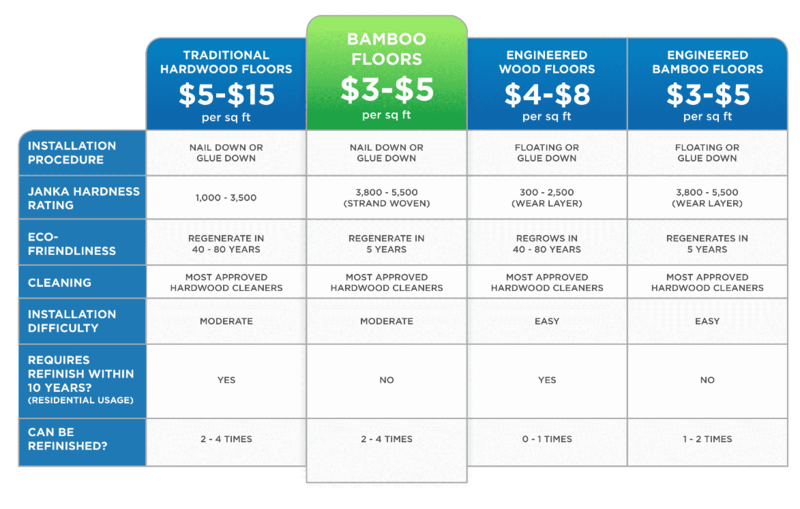 * When comparing bamboo flooring vs hardwood these benefits are difficult to ignore. Greater biomass & oxygen. Bamboo produces greater biomass - a renewable energy source - and 30% more oxygen than a hardwood forest of comparable size. Reduces CO2. Bamboo helps reduce carbon dioxide gases. Some bamboo sequesters up to 12 tons of carbon dioxide per hectare. Serves as a water barrier. Because of its widespread root system and large canopy, bamboo greatly reduces rain runoff, prevents massive soil erosion and keeps twice as much water in a watershed. It also helps mitigate water pollution due to its high nitrogen consumption. Restores degraded lands. Bamboo can be grown in soil damaged by overgrazing and poor agriculture. Proper harvesting does not kill the bamboo plant, so the topsoil is held in place. Bamboo's dense litter on the forest floor feeds the topsoil, restoring healthy agricultural lands for generations to come.